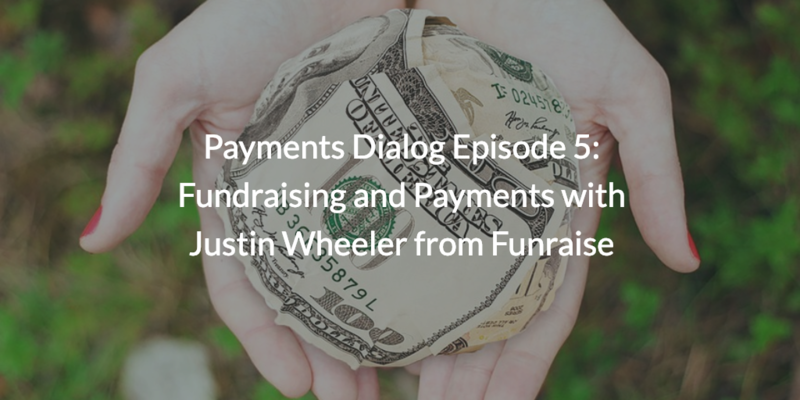 All right thank you everyone for watching here with us I've got Justin Wheeler on this round of the Payments Dialog that we're hosting here at Spreedly. I'm super excited to have him Justin's actually with Funraise and Funraise has been on our platform for a while and just and I'd love it if you could just give us a quick rundown of like what Funraise does like what's what's your space what who your customers what kind of problems? we were working specifically in the nonprofit vertical so we're a SaaS company selling directly to nonprofit organizations of all sizes and essentially our product it's a variety of different tools baked in web platform so everything from fundraising like online payments to crowdfunding to peer-to-peer fundraising to recurring donor programs subscriptions and so forth all the way to the CRM capabilities, email marketing, automations workflows donor cultivation moves. Basically all of these major fundraising tactics that nonprofits use today in today's environment. All that product is very singularly focused by one or two different companies and so what we've done is we've brought all the tactics at the one platform so that organizations, specifically nonprofits, have better visibility on their data. Just kind of a quick example of that what you see oftentimes when you're using these 1-point solutions is you know. Justin the donor is different than Justin the purchaser or attendee or the individual that has fundraised or took part in an event so forth. So we've brought all of these tools together so that organizations have much better visibility and understanding on who their donors are, how they're involved with the organization now they're making an impact. It's very cool so there are a lot of different kinds of nonprofits out there. Are there particular verticals or particular sections that y'all I don't know maybe that you target or that you have the most traction with? So we we focus primarily right now on like 501c3 non profits and so these are these are like humanitarian, Human Services, religion those types of like nonprofits. We're not dealing to much right now in the education space but mostly within that that vertical. There's about 1.4 million nonprofits in this space over four hundred billion dollars a year donated to these nonprofits so it's a big industry which I think most people don't understand and perceive. But there's definitely a lot of opportunity to build a big business growth big business working directly with nonprofits. So looking at payments specifically and of course y'all are kind of centered around this concept of fundraising although that happens in lots of different ways like what ends up being really important for nonprofits in in the payment space? So I think that one of the you know one of the challenges and one of the reasons I started Funraise was if you think about the mission of a non-profit most nonprofits have these really big missions and are tackling the biggest challenges of the day but when it comes to their fundraising and the technology they're using to actually drive their mission there's just so outdated. There haven't been a lot of technology companies that have actually been like hey I want to build a company selling directly to nonprofits because they think maybe it's not a big enough market. And so when you look at came into the nonprofit space and you look at that number four hundred billion dollars and today only 10 percent of that is being captured online and you see there's a lot of opportunity to modernize how fundraising is happening. The great thing about that is we don't have to be the driver for that it is already happening because of demographics switch in the donor population. When I started Funraise I saw we're on the brink of a huge shift in the donor landscape and in the total philanthropic landscape and nonprofits need to modernize or they're going to die. So payments is one of those areas where you know it should be very easy it should be very familiar for a donor to go to the favorite charity, make a donation, and feel like it was buying something on Amazon we're signing up for Netflix. Today it's very archaic it's like filling out an application and many times it's hard to even find where can I make a donation on the website. So payments is an incredible opportunity for non profit organizations today not only to introduce a new revenue stream but also to make it make a more efficient process and raising funds online through you know a better ui/ux on the front end. So what are the what are the challenges that nonprofits run up against maybe some of them you know kind of normal to the space that they're in and then maybe some of them like are there any of them that are kind of due to the way nonprofits tend to be structured? Like what do they what are the challenges to taking more of this transaction volume online? So you know it's so funny because like one of the challenges and the common objections you know we come across is we just don't have the demographic that will give online. And just you know I think that's kind of like an pre Walmart going online that was like Walmart saying "oh like our shoppers aren't gonna buy stuff online". If you make it available people will do it and then on top of that you're gonna attract a whole new type of consumer that this is their this is how they grew up buying things. Similarly in the nonprofit space you have that mentality where organizations are like "you know we don't we don't have that demographic people prefer to send checks. We're afraid, we don't want to pay credit card fees". When in reality it's probably more expensive to actually reconcile a check. And credit online payment and so the common objection is just like getting over that understanding if you put the tools in place you will see you know you will see a return and that's like that's almost a guarantee for any nonprofit. And so it's just helping change that perception that like your audience is kind of dictated by the tools you are giving them the technology you're providing as an organization. Also: I think you know the the other common challenge is just implementation. A lot of nonprofits don't prioritize technology or technical people on their team. They look at that more as a luxury not necessarily like mission-critical. And so our approach from the beginning was in order to for us to attract the nonprofit that maybe didn't have those resources but at the same time attract organizations who did was to make our platform the core product very out of the box. It's easier than creating a Facebook profile to get a donation button on your website and so forth and then for the more advanced nonprofit you can customize the user experience to your liking right. And so like we're an API first company for that reasons that nonprofits have the ability to use our SDK our API and actually customize their own giving experience because that's more on the enterprise level of the offering. But I think that that overcoming the objection if I can we get this implemented and we do have an eye on support if it's implemented then you start to see a lot of a lot of traction a lot of success that makes sense. Absolutely so I mean what y'all offer a decent amount of flexibility to the nonprofits on your products in terms of their payment stack etcetera like what what's the drag for that what's the benefit? Prior to Funraise I spent a decade in the nonprofit space started two different nonprofits on founding team of the organization called Invisible Children where we grew that organization to be 10 plus million in revenue all through digital online fundraising built our own tools for that. And then Liberate North Korea where we were also very successful in building the company the nonprofit. But we still ran into these pain points of just like not having great payment options fundraising options having great companies that we could utilize technology instead we had to do it ourselves but was more expensive and costly. So basically the reason why we decided to make the payment stack of Funraise more flexible is because nonprofit organizations are in a somewhat of a bad habit. They do change platforms quite a bit right. And that's because I think a lot of the solutions that are offered are kind of you know we do this we don't provide this we do this not that we're so the approaches we're gonna do everything which is not necessary always the best business approach you know it's good to focus on one thing and do that well we've decided to focus on everything and do it all well. And at the same time in order to help migrate organizations from our competitors or some of these legacy systems that been around we needed we needed a tool that would either allow us to work with their current set up their payment setup or provide a process where once they get onboard and we could leverage you know their volume to actually get better pricing for them to keep them around longer and so forth. We would do that and that's where tokenization came in, universal tokenization organization, and so forth. So we've seen the strategy work out really well for us as a company from a strategic perspective. We've got dozens and upon dozens of gateways that were supporting through Spreedly to work with nonprofits of all different types and that that gives us the ability to not have to you build this thing on one payment infrastructure and then be kind of subject to their roadmap and what they offer right. If we want to do something that many customers today were using several different gateways because they offer different tools different gateways and so we've built even our infrastructure to be like it. If this gateway can't handle this type of payment automatically use this gateway and then that's allowed us to do some really cool things. It's allowed us to do some really sophisticated things with bigger customers, enterprise non-profits are doing you know hundred million plus per year in revenue. It's also allowed us to go international much faster. It's allowed us to work you know we've got we've got servers that have offices set up in ten different countries and prefer to use ten different gateways in that setting. Our platform can handle that through you know innovation and Spreedly. So that's just we just seemed out to be it was a from day one was a strategic decision. And it was I would say like it's become much more it was much more prevalent in the sales cycle than I thought it would be rather. You know they don't know what gateway they have about they don't care about gateways. But it actually it actually is y'all know they do you care about it. They may have workflows built around some of these gateways and their strategies and so forth. So that's something that we've seen to work really well for us. To be able to have like this very flexible payments back end. Y'all are infrastructure right how do you all go about convincing nonprofits to spend on infrastructure? So that's a great question in fact or something this is a topic I'm very passionate about because I think that nonprofit the reason why non profits are cheap today is not because they are nonprofit organizations right but it's because of the expectation that donors put on the profits in terms of the return of that they want to see on their donation? I mean by that is most nonprofits have in order to be like a high ranked nonprofit on anybody's charity watchdog sites they have to kind of follow this 80/20 rule. 80% of our revenue goes to programs and only 20% goes on infrastructure tell me a business that operates like that and is big and successful making big impact. It's it's hard for profit products to operate under that type of margin. And so I think that the first challenge is helping nonprofits actually overcome that. Hey there this is kind of an old way of thinking about about charity it's evolving and the donors want to see more put into infrastructure, security, R&D because it's an investment in the future. Most donors are sophisticated enough today to know that. And so it's helping non-profits to get out of that like cycle of like self induced poverty self induced cheapness because of these perceptions that I think the past kind of donor demographic than the current demographic and so we spent a lot of time actually doing content around that helping organizations kind of break through that cycle. But yes I mean nonprofits you know with that said you know aren't very well resourced. So you know selling to nonprofits I always say this to our customers. Most businesses or individual consumers you're selling to if it's shiny if it looks good you're gonna buy it. With non-profits, they're very sensitive to pricing and very sensitive to the cost of something and it just makes it harder to sell to. You know I think that what we've how we've overcome this objection is has really been to show the value right. If you spend money on something like like Funraise or spend money on infrastructure it will pay off. And it's helping them understand that's helping to paint that picture of what it's going to do for you in the future in the next six 12 18 months. How much time it's going to save. Often times it's a big problem with nonprofit industry it's just how inefficient right things are and infrastructure and technology really help streamline processes make things more effective and accurate so that nonprofit workers can spend time spend time on things that really matter. Whether it's cultivating relationships defining impact, monitoring programs, and so forth. So yes I'll have to say it's been a challenge but I'm hopeful that we can overcome it by changing perception around what makes nonprofit good in terms of its overall impact you know on society. It does seem like a lot of nonprofits will sort of underspend on infrastructure and then make it up by burning lots and lots of volunteer hours. You know folks who are willing to work for cheap hours making up for the fact like that time also is worth something. I'm probably going to sound somewhat like a I was guilty of this for such a long time but we only like the only thing that the real cost to us is like money leaving the bank. But not the actual time invest on something. You're building a company you look at well you know "can we can be like pay for something to do this faster?" Than like having three people do it. Is there a technology that exists can we automate it, can we do whatever. Nonprofits don't think like that they think like well if we can find 20 volunteers or if we can have our VP of fundraising manually entering these these checks it's gonna be worth the savings. It's not it's never worth the savings if you're wasting valuable time. We also talk a lot about this in a lot of our content marketing like what is the real cost of XY and Z helping non profits understand that there's a cost to everything whether or not it has a dollar value. You just touched on something and you mentioned it earlier this concept of like when we move there's this perception that credit card fees are really expensive and they had all this overhead and checks are quote unquote free you know. But really they're not. They require all this handling time and everything else and so do you all have any metrics or anything around the comparison of doing transactions online versus the old-school apparently free but actually expensive offline transactions? We've begun doing some analysis and like there is like a tipping point that right we're like if you're gonna give a hundred thousand dollars it's probably cheaper to write a check than to spend you know 2.9 percent platform fees. As well that that's going to be more expensive than actually you know the more kind of traditional way. And so there's definitely a compliment we've actually seen and we talk a lot about with our customers is like it's around $25,000 and below is where it makes the most sense to really push hard for individuals to give. It's not just it's the handling cost involved but it's also the like you know if I'm at an event and I pledge to get a minimum of money $25,000 and I have the ability to do it right then and there, the organization is much more likely to get that gift versus you know an 80% maybes return rate on actual pledges. And so it's there is an advantage and a strategy to be to be had for collecting in real time versus following up and something might change in a week with individual. Maybe the individual isn't as passionate anymore or something came up where that expense is much harder to stomach. And so the timeliness of accepting payments and donations has a real advantage over someone writing a check. Those are the things that topics we talk about a lot. You can imagine one extra two thousand dollar donation and an event paying all of the credit cards and you just got to get one more and you're ahead. We've actually created a tool. You see this a lot across several platforms it's called the donor fee. The donor can opt in to cover the fees. That's not necessarily revenue for the organization. What we've done is we've actually opened that up. Nonprofits basically put in their own percentage and we see anywhere between like one to ten percent. Well it's more than upsell. It's saying hey it helped us cover the cost of operations or help us keep the lights on on top of this donation. And you know we've we've seen organizations raise more from that feature than their total costs of our platform and credit card fees combined. It's just giving because they're generating their control of that revenue you know. That's not going to the actual company that's built the tool it's actually going into their bank account and they can use those funds to pay for their their fees or do whatever with it. And so I think there's also in these creative ways where you can tell non profits get past that so that's not even really a line item in the budget. So one of the things we've seen and it goes to the you know make lowering friction and making sure people can give we've seen a lot of nonprofits kind of and businesses serving nonprofits focused on uptime and availability around you know payments stuff like what do y'all see there and and does that become a major concern with the folks on your platform and an actual effect on giving? Absolutely I mean you know there is nothing worse than being a company providing the payments infrastructure to a nonprofit organization and for it to go down -- because you are cutting off a line of revenue. You're cutting off the blood that flows into the organization. Right and that sounds like traumatic but that's how nonprofits perceive any sort of down time or stability issues. So this is actually something that comes up quite a require SLAs because they want to ensure that they're not going to encounter any sort of any sort of downtime and so forth. The reason why this is I think particularly interesting in the nonprofit space is you have the volume, the process volume, with nonprofits is very seasonal and so q4 forty fifty percent of revenue comes in for nonprofit organizations. But even like more specifically within Q4 for you've got these like specific giving days that for example giving Tuesday. Yesterday probably over three hundred million dollars was processed online in one day. And so being able to provide the infrastructure that would manage something like that. Or December 31st is another one of the biggest giving get bigger than living today and so being able to have a very stable payments infrastructure is absolutely critical because if you go down with one of those days you're gonna the nonprofit is going to hurt from it it's going to it's not going to be a good one. Or two percent impact on budget and so this is something that is often comes up in the sales cycle and something that non-profits pay attention to and it I would say it's this and security like the two big things right in this infrastructure. I mean it feel it seems like the fact that it's donations and not purchases exacerbates that a lot right. Just because I'm not it's not like I'm buying toothpaste so I'm gonna have to buy toothpaste anyhow so if it's down yeah I wouldn't be happy but I'll come back and I'll buy toothpaste at some point. A lost the donor versus like a lost consumer buying you know your everyday product is very different. If I go and donate to a charity and their site's down there's no it made may be very unlikely I'm going to go back to that site again for a few months or a year or so. Nonprofit websites aren't built to keep consumers coming back and so I'm on the site for the reason to donate it's just like I have to remember to do it again. And so it may never happens now. Non-profits get that. They're like we've got you here we've got your attention and it better work on the first time where there may not be a second time. So the one last question I had for you was just around subscriptions. So a lot of businesses do subscriptions y'all are software as a service. So you turned your customer subscriptions what do you see as sort of the play around subscriptions in the nonprofit space? Do you see that recurring mechanism is that a big part of y'all's business and how you're servicing nonprofits and how do y'all think about that? That's a good question I mean we build a lot of product around subscriptions to help nonprofits really utilize this. The reason for that is pretty straightforward and simple. A recurring donor gives 42 percent more in a year. If you want to have a sustainable revenue stream and raise more money then it's very obvious from the research that a recurring donation program or a subscription program is going to grow your business and be important. And so we've got all sorts of tools around that. You know one of them we're very excited when Spreedly launched the auto account updater. I think that was a year or two ago. One of the great things from that is like when we migrate customers on to Funraise and we migrate their recurring subscriptions we can actually look at their lapsed donors that you have for whatever reason have had failed in previous months. In many cases have been able to see like a twenty ten to twenty percent increase on their recurring revenue when the sign on Funraise because we're able to update that. So this is definitely much bigger and today in nonprofit fundraising than it ever has been. Charity water organization that has really kind of been a front-runner in utilizing technology for raising funds they built a 10 million dollar subscription program in less than a year. I think part of the reason why today it's easier to do it is we're used to subscriptions as consumers we're used to it. Finding things and paying a monthly fee and it makes so much sense when you know I can I can do that with a non-profit. The other thing too is you know you're looking at like the millennial generation which is becoming one of the wealthiest donor demographics in today's giving culture. Over 52 percent have opted in and said that I would rather give on a monthly basis then a one-time large gift. It's just for cash flow or for whatever the reason it just makes a lot more sense to do that. And then the last thing I'd say on that is it gives the organization the opportunity to really cultivate and build relationships with donors. The idea is how do we keep this donor you know addressing the LTV? Giving 24 months instead of 12 months. Or four to six months. And you have opportunity to do that through the engagement strategies that you put in place as a result of having all these recurring donors. As we move into 2019 it's one of our big focuses as a company as well as to really increase the awareness around that to our customers and to continue building product that's going to help nonprofits. Sign up more current donors. Very cool. Maybe you know this off the top of your head. What percentage of the customers on your platform are doing the kind of recurring donation at this point? I mean definitely a hundred stores have had at least one recurring donor and we're seeing you know we're seeing millions of dollars a year transacted by recurring donors. We've got a customer who just recently did a recurring campaign, ran it for a month long and signed up 3,000 new recurring donors. Just being able to transition from having to go out hat in hand and sort of rebuild a whole cycle every time versus having this continuing stream that you can then go and use and have more confidence in. Absolutely. When you're building out a budget for the following year and you can look at your committed revenue for the next year you can be able to do a lot more cool things if your focus is on building a sustainable revenue stream. A lot of times that I would say that maybe five years ago that was kind of like the trend is like how do we build sustainable revenue and the idea wasn't recurring donations the idea was a product that we can sell. That didn't really catch on too much in the nonprofit community but what can is building a program around recurring giving. That has to be tied with content it has to be tied tight with incentives. So it works it plays very well to donor demographic today. Thanks so much for coming on really enjoyed this I learned some really interesting things about nonprofits and I hope other folks did too. Thanks everyone for hanging out with us on another Payments Dialog we'll see you next time.